About 9 pm or so we ventured out for dinner. The first place we tried, an empty restaurant at that early hour, said they were completely booked. The second said we were welcome to eat at the bar. We did settle at the bar, but before we had even take the first sip of the wine we ordered, we were offered a table. That seemed to be the pattern in this restaurant, a place called La Taberna del Zurdo. Our food was creative and tasty. I’ll spare you the details – but suffice it to say, it is a place to try. Again, a short conversation with table neighbors revealed a couple visiting Oviedo for the first communion of a niece and enjoying a dinner out without family! They even had a friend who lives in Puerto Rico! It was a good decision since the weather was sunny and warm and the views alone would have made the trip pleasant. At the Iglesia de Santa María del Naranco we bought tickets for the tour of both churches, this one and San Miguel de Lillo, which is about 200 yards farther up the hill. You can only see them inside on a tour, so be prepared if you want to be able to go inside. I am sure you can see and photograph the outsides at any time. These two structures are significant in that they date from the 9th century! 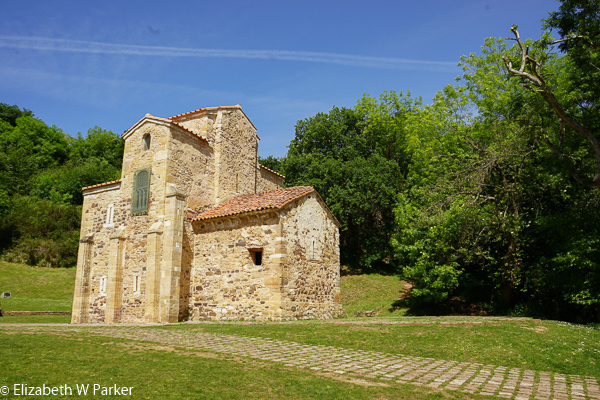 We have seen many churches and others structures from the 11th century onward, but these are by far the oldest for us on this trip (not counting Altamira – but we didn’t really get to see that). The understated decoration gives them away immediately! They were painted in their heyday, but with my modern sensibilities the unpainted, simple stonework looks elegant to me. Here are some of the earliest examples of extant vaulted, stone ceilings. Beautiful rounded arches reveal them as pre-Romanesque. The relief decoration is shallow, but in some cases still quite sharp. The images used are different from those seen in religious buildings suggesting that these were not necessarily religious in their earliest lives. 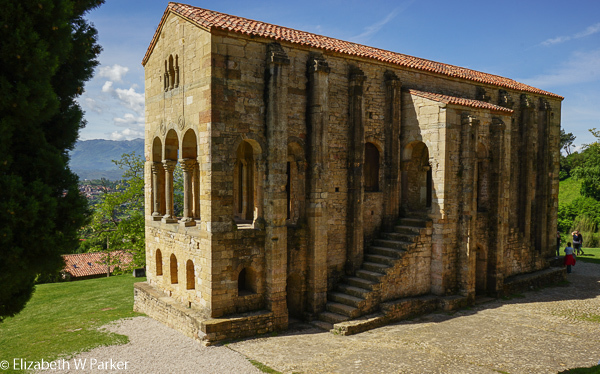 The view of Santa Maria del Naranco from a little way down the hill further suggests that the building’s original use was not that of a church based on the placement of the door and the windows, as well as its position on a hill overlooking the town. In San Miguel de Lillo, there are carvings on the door jambs that are in extremely good condition and have fine details. Both churches are extremely interesting and worth the trip. The tour takes about an hour, and I will venture to guess, they are scheduled about every half hour. A leisurely walk back to the car, set us off on another trip of discovery. 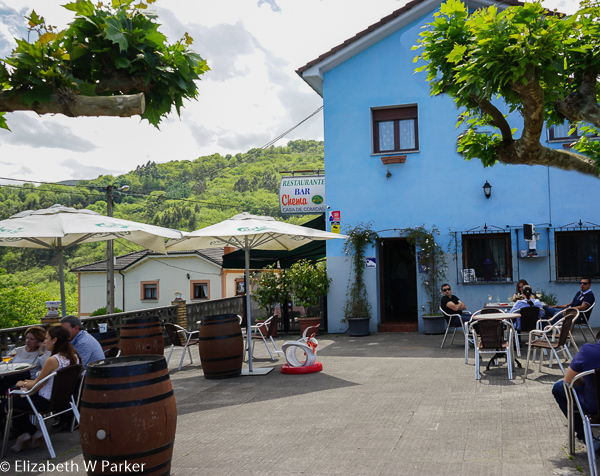 This time we are headed to the environs of Oviedo to the southwest of the city, in search of a restaurant called Casa (or Bar) Chema – purported to have an excellent fabada vegana. A fabada is a bean casserole, usually with meat (luscious, fatty salt pork, sausages and the like!). So to be famous for a vegan version is really saying something! Gerry had the meat version, I had the vegan version, and we were both extremely happy with our choices! I even got to have vegan ice cream for dessert! Meat or meatless, a fabada is not a light dish, so it’s back to Oviedo and the hotel for a nap. On the way, we made two brief stops at places we noted on the way to the restaurant. 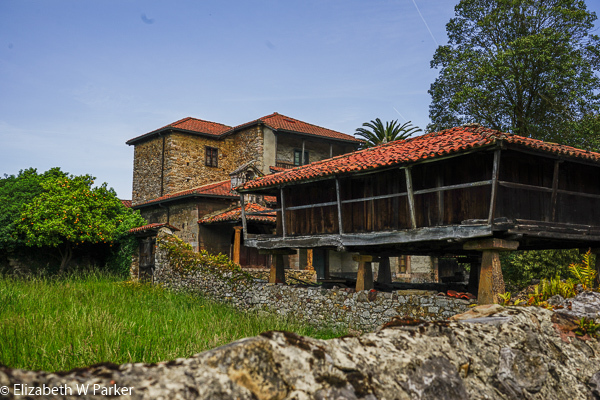 Both were pretty run down, but had the typical Asturian hórreos, a storage building on stilts, for keeping silage and vegetables away from the elements and animals. The number of abandoned properties in Asturias makes me dream about the thrill of buying a fixer-upper in Spain. Anyone will to go in on it with me? During my nap, I got to speak to both of my sons and receive my Happy Mothers Day wishes, now that they were both out of bed! Later that afternoon, we walked across the lovely San Francisco Park and into the old city. The cathedral was our first destination, but because of a mass in progress, tourists were not permitted to enter. So instead, we wandered a bit aimlessly around the city, discovering a just-concluded cider festival on Gascona Street, and a fountain of potable water from the IX century! Here is a link to Wikipedia’s article about Oviedo. 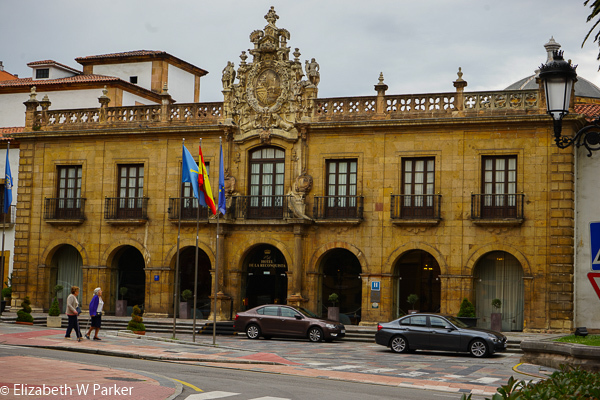 I am including it here because it talks about Oviedo’s rich architectural history. 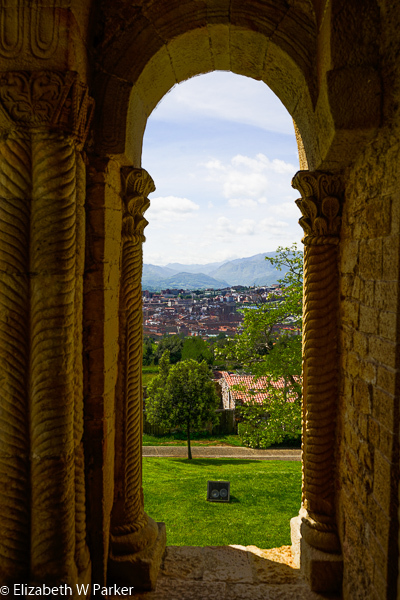 I came to this information after being in Oviedo, and after noticing while I was there how many interesting and beautiful buildings this city has…and not just important buildings like churches or a city hall – but everyday buildings, banks and apartment blocks, too. Though we did not do much in Oviedo, it was a good rest stop for us, allowing us to relax and just walk the city. The San Francisco Park was a favorite place and we walked through it every chance we got. As I said, I loved looking at all the interesting buildings and it seemed to me that the city would be a very livable place. Gerry had a dentist appointment, so I had a slow morning working on this blog. When he returned we ate a late breakfast of sandwiches and coffee and went out on a little personal pilgrimage! 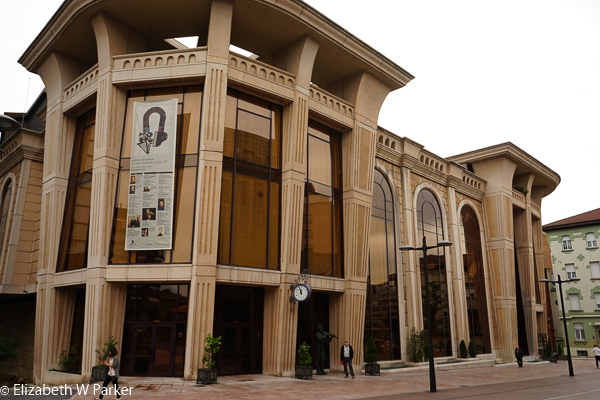 Principe Felipe Auditorium – Home of the Orquesta Sinfonica del Principato de Asturias. By 1 pm we were on the road to Santiago de Compostela. That’s where the next section of the blog will pick up.